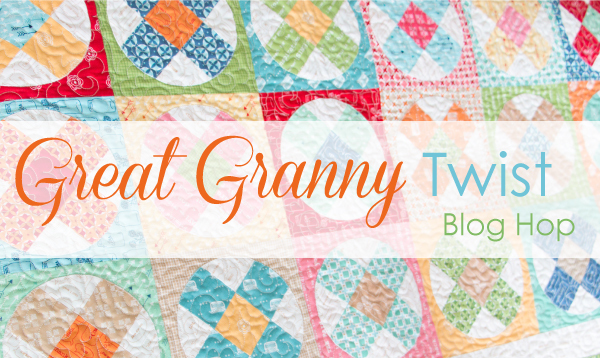 Great Granny with a Twist & a Giveaway!!! Good Morning! 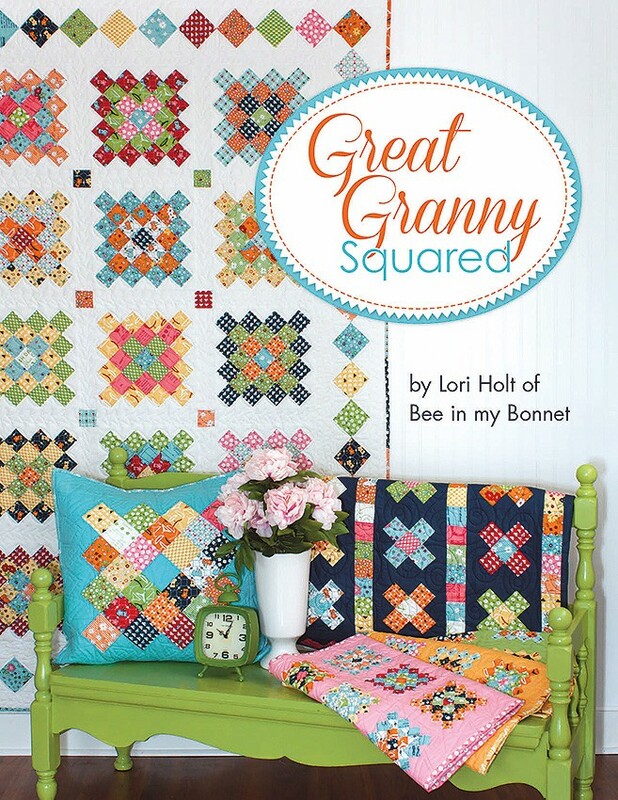 Today I'm celebrating the anniversary of the lovely Lori Holt's book Great Granny Squared along with Lori and some of her quilty friends. 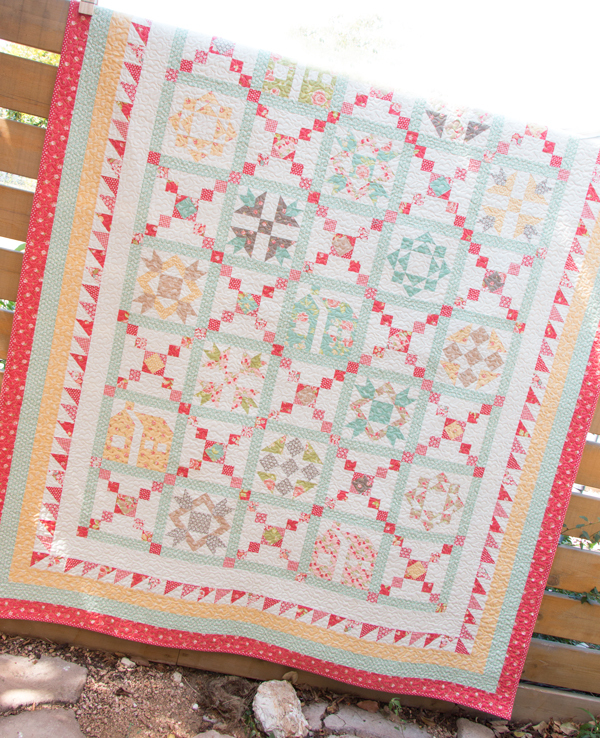 For something extra fun we made projects that use the squares from the book but with a twist of some kind. My Great Granny Squared project uses the "mama" block form Lori's book. 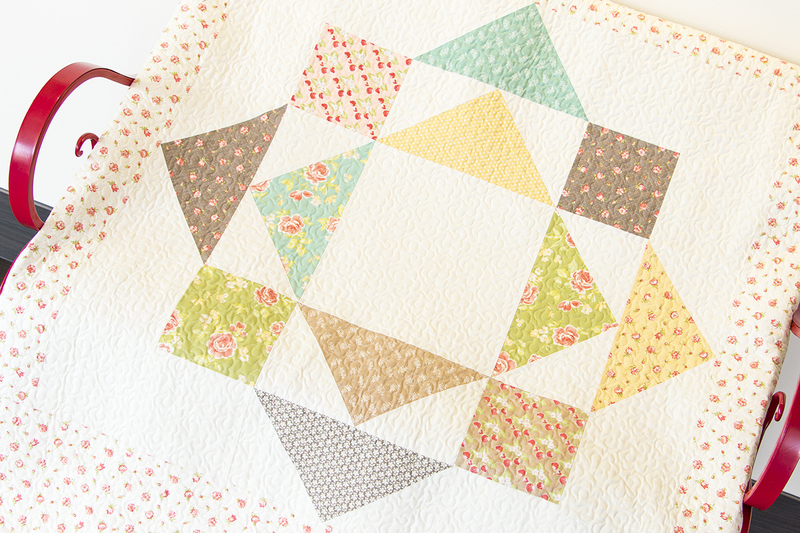 I made 9 blocks using Nadra Ridgeway of Ellis & Higgs Bloom and Bliss fabric and an aqua solid I had in my stash. I can't remember the maker, sorry about that. The back of the pillow is envelope style and all I did was press the top and side edges in 1/4 inch to get a finished edge and sew it to the back of the crocheted edge wrong sides together. I stitched it down with a fat 1/8 inch seam. 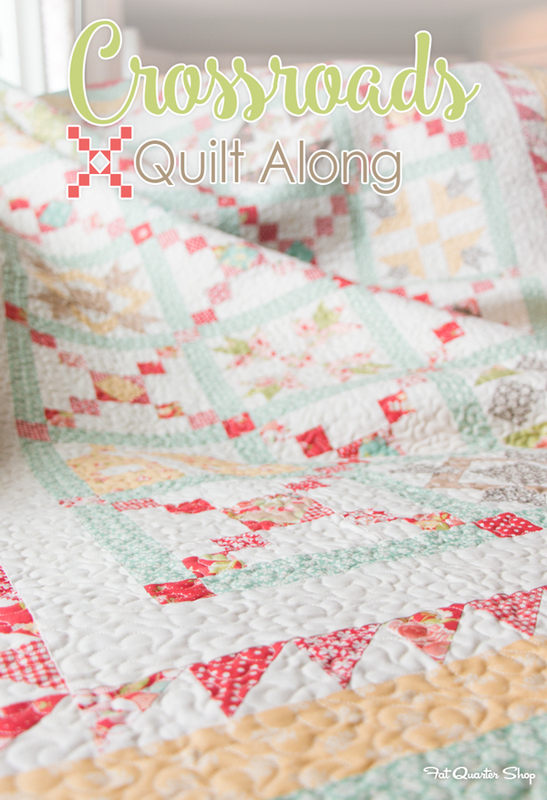 Things get a little squooshy sewing to the yarn but it does sew down very securely. I made a pillow form to fit it. It's about 18 x 18 inches. I love it! I can't wait to make another! If you would like to have Lori's book Great Granny Squared and make some of the fun projects in it or put your own twist on them you're in luck! 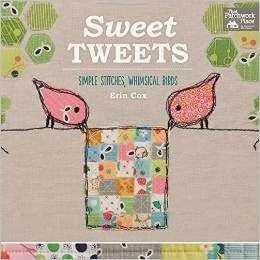 I have a copy of the book to send to one of you lovelies thanks to Fat Quarter Shop! Just leave a comment below. I'll pick a winner next week. Then be sure to check out the other quilty friends celebrating with Lori and the twist they put on their Great Granny projects! 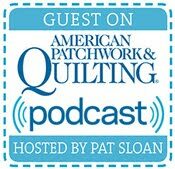 I am so happy to be participating in the 2016 Crossroads Quilt Along with Fat Quarter Shop. This year we will be sewing a vintage inspired quilt using Strawberry Fields Revisited by Fig Tree Quilts! I am so thrilled that Moda is reprinting some of the originals and some new prints for this line. Now I feel like I don't have to hold on so tightly to the original scraps I still have. It was one of my all time favorites. But the best part about the quilt along is that is supporting the March of Dimes an organization dedicated to preventing premature birth, birth defects and infant mortality. 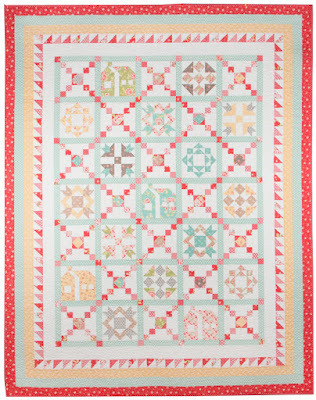 Each pattern is free, but a $5 donation to March of Dimes is requested for each pattern download. I was asked if I would mind sharing about a transforming time in my life...a crossroads. Like you, I am sure there are many. But the single most important, life changing thing that happened to me was becoming a mother. It's not a crossroads in the typical sense of the word, but it did change my life forever. There was never any going back to the girl I once was. I had this little new life who was completely dependent upon me. That intense love that filled my heart until it was bursting at the seams. Knowing what it felt like to love someone so much you would lay down your life for them. Staring at that sweet angel face for hours while she slept in my arms. There is nothing like it in this world. That's my crossroads. 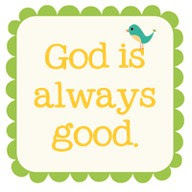 The most important event in my life and I know that I am blessed and forever changed. 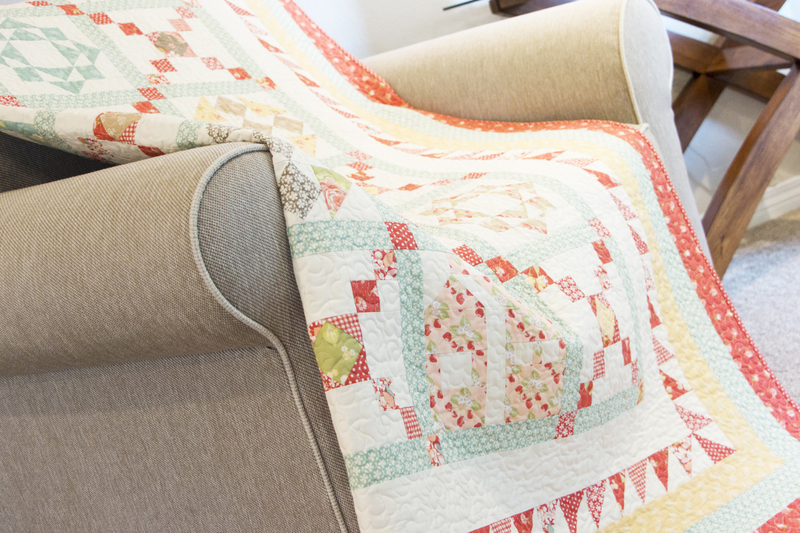 Share your progress and creations with us on our Crossroads Facebook group. 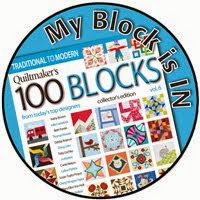 Post your blocks using #crossroadsquiltalong on Facebook, Twitter, and Instagram.